Audio/Video chat is the “next” big thing and a lot of people use Skype already to get that functionality on Linux without much hazzle (certainly a few use Ekiga aswell). Just recently the popular instant messenger Pidgin joined the ranks with their 2.6 release which introduced A/V chat for Jabber (XMPP) users. However, finally it looks like there will be a decent way on Linux to have A/V chat with the very popular MSN protocol! 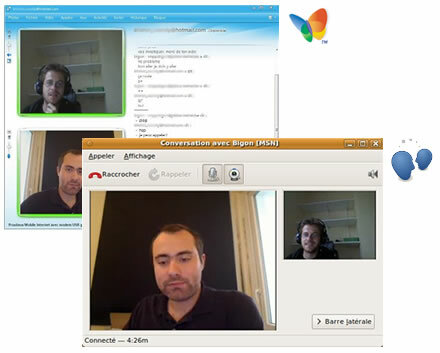 As announced by Guillaume Desmottes, Telepathy, the framework behind the instant messaging client Empathy, has now finally gained support for Audio/Video chat using MSN! Apart from that he mentions that file transfer and offline messaging support is also done and being merged. Total awesomeness on the internets. Telepathy/Empathy is part of the next GNOME Desktop release thus these changes are expected to hit the next cycle of distribution releases.